The city council approved the sale of the Paterson Armory for $3 million to prominent developer Charles Florio on Tuesday night. Council members voted to approve the sale without opposition. Many expressed optimism the long decaying site will finally be put to productive use. Florio impressed the council with his proposal to build a six-story building that will contain 138 luxury apartments and 10,000 square feet of retail space. His proposal, unveiled through a series of slides, wowed council members last week. Velez had to recuse himself from the vote because he rents a house from Florio. “I believe this is right for the city of Paterson,” said council president Maritza Davila. 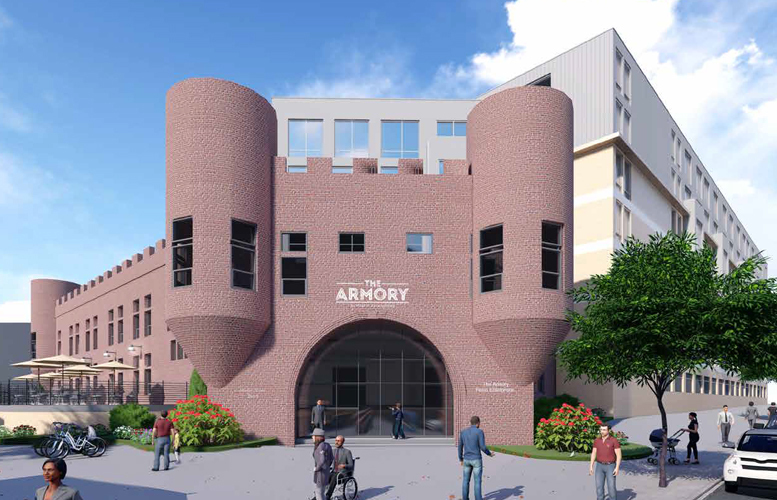 Florio’s proposal preserves what remains of the old Paterson Armory. Much of the building was destroyed by a fire in 2015. Council members Michael Jackson and William McKoy viewed the sale and the proposal for the site as a model for other developers to follow. Florio’s offer was six times the appraised value of the property. A second developer, BlueOnyx, made a $1.9 million offer for the same site. In the past developers have sought tax breaks and other incentives to undertake projects in Paterson. Florio has taken a very different approach. He has said he won’t seek incentives or tax abatements for the project. He also plans to purchase materials from local businesses and hire local residents to work on putting up the new building. The measure approving the sale also designated Florio’s firm, 461-473 Market Street LLC, as the redeveloper for the site. Jackson, 1st Ward councilman, inquired about the redevelopment agreement. He noted it was not attached to the resolution. The city has 180 days to hammered out an agreement with the developer. “That will still come before you,” said Khalifah Shabazz, the city’s chief attorney, to Jackson. She said once an agreement has been reached it will have to be approved by the governing body. Florio estimates his mixed-use development will cost $17 to $20 million. He expects to have the project completed within two years.